Good morning my dear readers! I hope that this week has been going well for you and that wherever you are the weather is in full Autumn’s bliss! 🙂 I can’t believe how fast it gets dark over here in Helsinki?! Each day seems to last shorter and shorter. Driving home yesterday around 4 pm felt as if it would have been 8pm instead. When the weather is gloomy, days are short and we’re all lacking colors around us, I try to not forget that it’s more than welcome to throw on some colorful clothes on before leaving my home. I used to be prone to dressing up in grey and black or in general dark tonned clothes, esp. during the Winter. Now, I’m all about trying to keep my spirit up by picking warm, but colorful pieces like this cashmere poncho By PIA’S. About 2 months ago, I have discovered this, completely new to me, designer name at one of the PR’s/ showrooms in Helsinki. It caught my attention that much that I just knew we needed to collaborate together. By Pia’s design is one woman’s passion for natural linen clothing and home textiles. Pia’s was born in 2011 and ever since then, all of the garments are handmade with love and with only high quality fabrics. The inspiration comes from the Finnish nature and models from the Scandinavian trends with the twist of vintage looks. Pia’s cashmere line is made in Italy and it consists of luxurious and soft shawls, scarves, hats and ponchos for all year around use. On Pia’s website/ web shop you can also find home textiles, knits, designs for men, etc. *This post was made in collaboration with By Pia’s design. All of opinions are my own. I love how you layered that poncho over such a busy shirt! Plus, the little touch of Chanel looks perfect. I just stumbled across your cute blog! Love it! This colour and the print is beautiful on you in combination with your red lips! I love the Hunters! Thanks so much Nancy, I’m happy to read that you liked this outfit! The Chanel brooch is SO adorable! Love the color combination. you look flawless. Thank you very much Beatrice!! Such a beautiful and classy look. Love the soft colors on you! Ponco je secer pravi… cak me i podsjetio na secernu vunu 🙂 Divno ga nosis na ovu sarenu kosuljicu i bas si mi krasna od glave do pete. Ponco je presladak, djeluje mi jako mekano, a košuljica ga je baš fino podignula 🙂 Jako mi se sviđa čitavi look, divno izgledaš! That is a lovely sweater and your layers really work so well together. 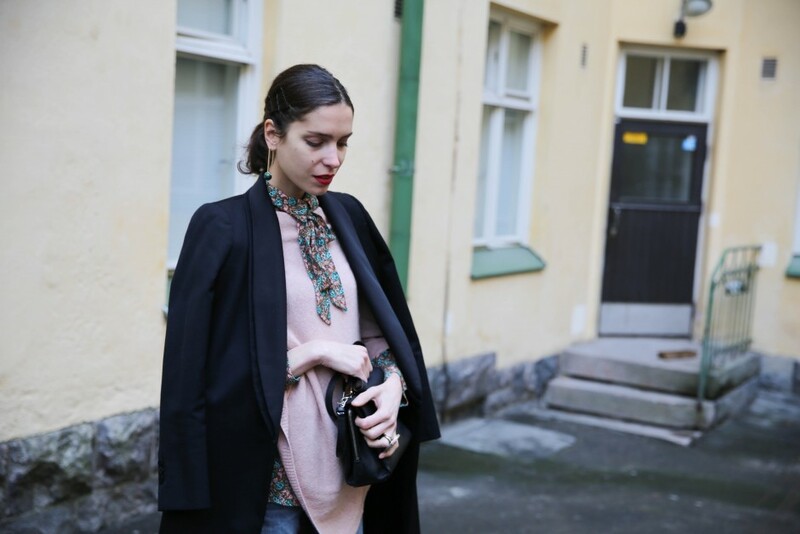 Love the tie blouse! It gets dark here so early too. My least favorite part of winter! Your outfits are so gorgeous! 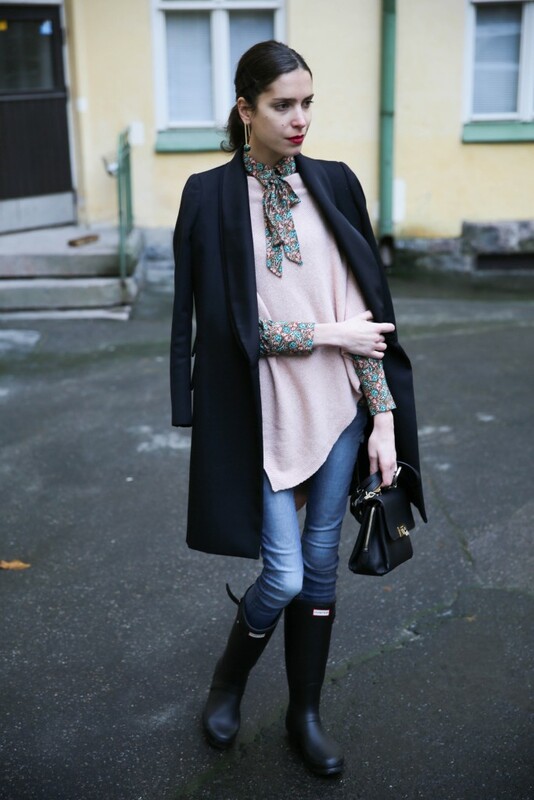 Love your Hunter boots. I love the color of the sweater, is super sweet. And it goes perfect with the boots! I just love your smile! So warmhearted! Love your outfit!! Looks beautiful! this look is layer perfection! super chic look! I love that tie front top! So beautiful and colorful! I am falling more and more in love with pink too when people like you wear it so nicely! Great look! Beautiful shirt and poncho, love them both together!!! love the shirt and poncho combination! i love how you layered that beautiful printed top. thanks for your lovely comments! :)) you are the best! killin’ me softly with the look:)…….. I love your look! I this I must be the biggest fan of rain boots! Love the outfit <3 especially the little touch of Chanel. Waouh i like your outfit ! So cute !